Arrival to Novgorod. Full day of sightseeing. 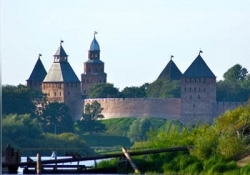 Established in 859 by a Viking Prince Rurik, Novgorod was a thriving trading community and a model city that set the proud traditions of self-government when princes were hired and fired by an assembly of citizens. We can say that in some way the history of Russia started here. It is here that Vikings founded their first settlements on the famous way “from the Vikings to the Greek”: from Scandinavian countries to Byzantium. It was the embryo of Russian state. 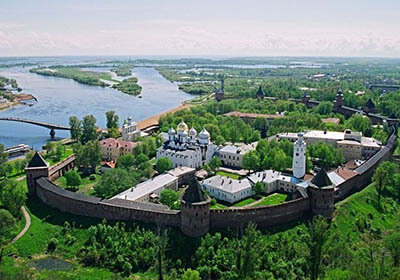 Later, in the 12th century, this town, one of the largest of the time, became called “Our Lord Novgorod the Great”. 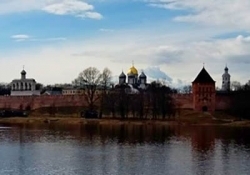 Until 1478, when Novgorod became part of the State of Moscow and hence, lost its independence, the town was a republic on its own, governed by a council of respectable citizens. Novgorod was also an important centre of Christian religion. 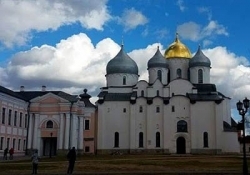 During your trip you will visit the magnificent Kremlin, the Byzantine Cathedral of St. Sophia, the oldest church in Russia. Explore the functioning Yuriev Monastery and a museum of Wooden architecture Vitoslavlitsy. 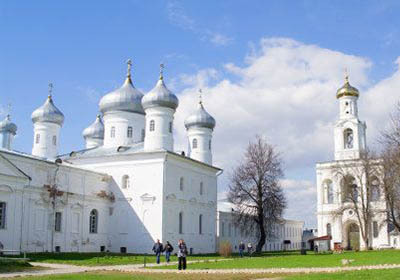 Founded in 1044, the Kremlin of Novgorod (the Detinets) is one of the most ancient kremlins which exist in Russia. You will see the St. Sophia Cathedral, the first stone cathedral in Russia, was built by prince Yaroslav the Wise a whole century before Our Lady of Paris, in 1045. 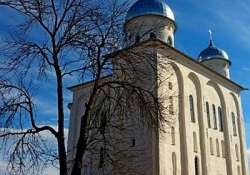 In the southern gallery eminent novgorodians are buried: princes, bishops and governors. 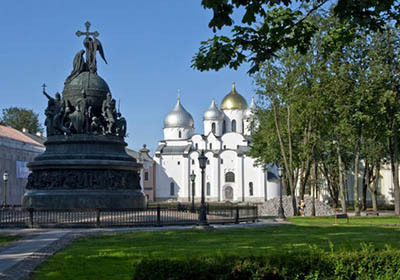 It is in this square, in front of this cathedral, that the “Veche” (the Parliament of Novgorod) gathered to elect the archbishop, declare wars or peace. The legend says that the dove decorating the dome of the cathedral is the symbol of Novgorod. The day when the dove flies away, the city will be destroyed. 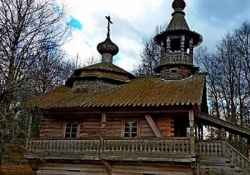 It used to be a real live dove that became petrified at the sight of the bloody massacre initiated by Ivan the Terrible in 1570. 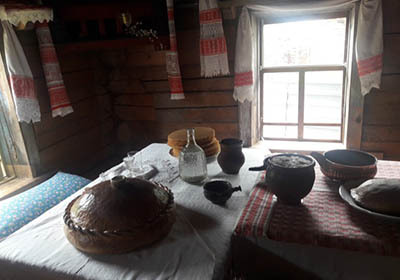 Yaroslav’s Court, Ancient Market. 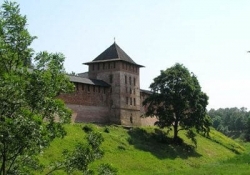 In the area of the Yaroslav’s Court were located many monuments from the 12th to the 18th centuries. 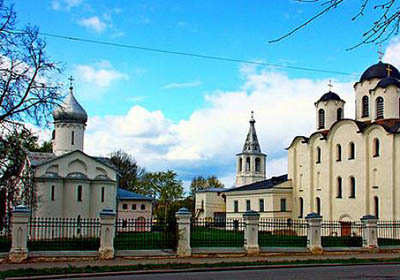 There, side by side stands the prince’s church (the 12th century) and the merchants’ churches, which were used not only as house of prayer, but also as storehouse. 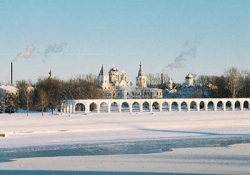 The Gate Tower, as well as the arcade, are a unique example of civil architecture, and were built at the time of Peter the Great. 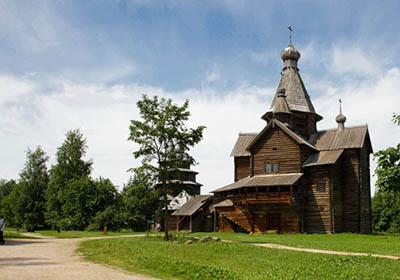 Next step of your exploring old Russian traditions and culture – visit to Open-Air Museum of Wooden Architecture Vitoslavlitsy. This is one of the most picturesque places in the Novgorod region. 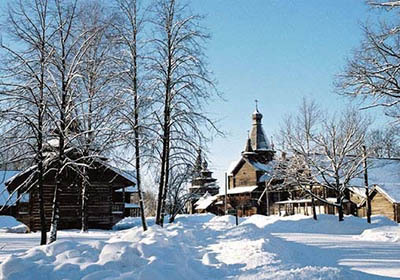 Izbas (village houses), chapels and churches form streets like those in old Russian villages. Restorers managed to preserve the unique works of Novgorodian carpenters. The buildings are so magnificent that they need no introduction. 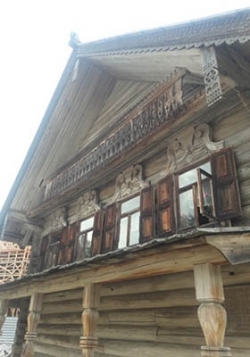 To get to know how Russian people lived many years ago, one must visit any of the izbas. 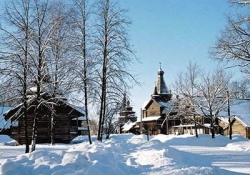 Vitoslavlitsy is famed for folk and trade festivals, Christmas fortune-telling and the International Bell Ringing Festival is annually held there. 21:00 – 22:00 Arrival to the hotel .